Let's get naked at Peruvie - a spanking new Peruvian grilled chicken restaurant in Taman Tun Dr Ismail! Now before you folks get the wrong idea, I'm just waxing lyrical about the outlet's Naked Burritos (RM12.90, add in chicken for RM16.90), a scrumptious melange of chopped capsicum, cucumber, tomato, lettuce, sweet corn kernels, spiced beans, cooked rice, sour cream and cheese sans the usual wheat flour wrapping. Stir everything up and the rich, unctuous mixture becomes a wanton treat. We descended on this eatery recently at the invitation of Penang Village's proprietress Connie Su. So what prompted the owners to venture into this little known cuisine? According to Su, they wanted to introduce something new to the local F&B scene and the robust, diverse flavours of Peruvian cuisine caught their imagination. "We also noticed there's growing interest in ethnic cuisine around the world," said Su. "Did you know that Peruvian cuisine share many similarities with Malaysian food? It comprises an interesting mix of European, African and Asian influences and the country's abundant supply of coastal seafood and tropical fruits are not that different from ours." To cuckold Malaysians into their Peruvian offering, they decided to crow about the Peruvian-style grilled chicken and presto, Taman Tun Dr Ismail residents now have a taste of the Peruvie Peruvian Grilled Chicken's delectable 'fowl play' right in their own backyard. Its relaxed, casual dining approach and reasonable prices also added to the 'coop' de grace. Horizontal wooden slats painted bright blue lend a charmingly rustic feel to the interior whilst clusters of ceramic hens and earthenware, potted planters of greenery and colourful ethnic wall murals amplify the place's homely surrounds. We were feted to ice-cold glasses of Sangria - a tantalising concoction of orange, apple and tropical fruit juices with apple cider vinegar; a godsend for the scorching weather we'd be experiencing lately. It also aids digestion since we were treated to a chicken licking good feast! Peruvian Chicken Soup for the soul...good to the last drop! The Peruvie Chicken Soup (RM6.90) may appear defying simple but there's no doubting the heartwarming broth's wholesome goodness. Needless to say we slurped up the mixed vegetables, shredded chicken and rice right down to the last drop after perking up the soulful soup with a squeeze of fresh lime juice. Reminiscent of our Sarawakian umai (raw fish salad), the Ceviche (RM10.90) we sampled had been tweaked slightly for local palates. Instead of sliced raw fish, the tart, tangy salad consisted of chopped lettuce, sliced onion, red and green peppers, cilantro and diced mango with sliced cooked prawns for pragmatic reasons. How does the star of the show - the Peruvian Grilled Chicken stand up to scrutiny? Very well I must say; the chicken which is first roasted and then grilled to order was juicily tender and deeply imbued by its flavourful marination of cumin, paprika, black pepper and oregano. Servings come in quarter (RM9.90), half (RM18.90) or whole bird (RM36.90) with or without two side dishes complemented by a choice of normal red or spicy sauce and Aji Amarillo Sauce (RM2), a green sauce of blended coriander with green peppers. The fiery red sauce is piquant with a muted nuttiness while the spicier version is zingier without being numbingly hot. Side dishes at RM5 each range from French fries, corn coconut rice, coleslaw, potato salad, butter sweet corn to tomato & cucumber salad can be ordered separately. 'Farn tung' (rice-loving enthusiasts) should opt for the rich coconut milk-based rice, best described as the Peruvian take of nasi lemak. The young and young at heart will find the Sausage Strips & Chips (RM8.50) satisfying enough to placate their finicky palates. Quinoa - the current grain of choice for health nuts makes an unexpected appearance in the guise of Crema Volteada Con Quinoa (RM7.90), a baked custard layered with palm sugar syrup and coconut milk. Think of it as sago pudding with a pleasantly gritty crunch. Personally I find the typical Peruvian dessert of Arroz Con Leche (RM6.90), rice milk pudding heavily accented with cinnamon and vanilla agreeable enough. Admittedly it's something of an acquired taste as us Malaysians rarely consume sweet permutations of rice unless it's glutinous rice. Hailed as one of the top restaurants in The Miele Guide, Erawan marks its 5th Anniversary with a big splash, coinciding with the recent Songkran Festival last Sunday. Having impressed all and sundry from day one, this fine Thai eatery has grown so much in stature that diners are compelled to make prior reservations and pre-order their dishes before they set foot there. Oh, you'd better show up on the dot at the appointed hour or else...Word has it that Erawan rarely accepts walks-in because all the food are single-handedly prepared by Chef Korn using the freshest ingredients based on orders received. A sense of welcoming homeliness prevails inside; handpainted wall murals serve as a pretty backdrop for the numerous pieces of intricately carved side cupboards and rustic furnishings, elephant figurines, whimsical leafy and floral chandeliers, vases of fresh flowers and artistic accents in the form of paintings and collectibles. There was no hiding my ecstatic delight when long-time friend Marian Eu invited us to attend Erawan's Songkran celebrations. It was a good excuse to finally see what's the fuss about...living in another far-flung corner of Klang Valley, we rarely ventured to Kota Damansara due largely to the horrendous city traffic and limited parking. The co-owners, Anan and Joanne welcomed us warmly whilst we waited in anticipation for lunch to be ready. This year, Chef Korn opted to go with a Thai Khanom (canape-like snacks) theme so dainty morsels of savoury and sweets were aplenty. The tapas-like offerings provided perfect fodder for avid shutterbugs too. One of the interesting tidbits we had was 'saku sai moo', translucent steamed sago balls with savoury, caramelised pork and crushed peanut filling, topped with fresh coriander and fried minced garlic. Another was juicy pineapple wedges topped with tasty minced chicken, preserved white radish and ground roasted peanuts...so simple yet chockful of flavours. True to its name, the chef also whipped up several fusion canapes: smoked duck with a robust curried dressing, banana blossom salad with maguro, Thai-style seafood salad, grilled wagyu with piquant dressing, salmon & carrot rolls, skewers of grilled chicken with pineapple, prawn paste with lemongrass, salmon & cucumber rolls and golden "net" parcels of beef and Thai salad amongst others. 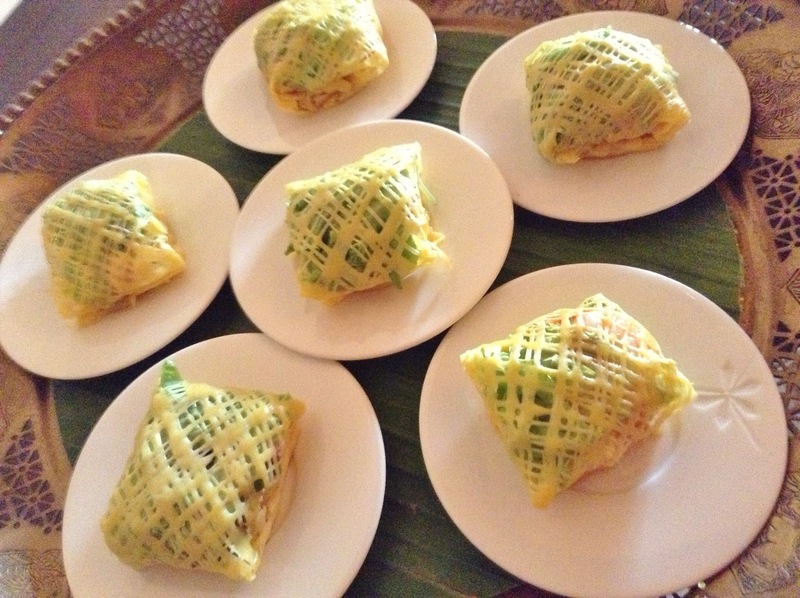 Little dishes of Thai laksa - 'khanom jeen' with mixed herbs and veges filled us up. A choice of fish curry and green chicken curry was served to go with the rice noodles. It was an enticing combination of sweet, spicy, mildly bitter, briny and tangy flavours coupled with the richness of coconut milk in the gravy. 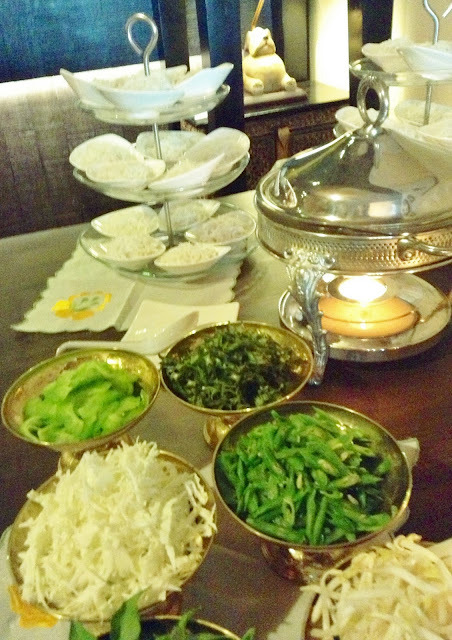 Different condiments laid out for Khanom Jeen. The service team also dished out bowls of full-bodied, soul-satisfying good beef noodles. The clear broth and tender chunks of beef were lapped up within minutes to the last drop. Stupendously yummy! 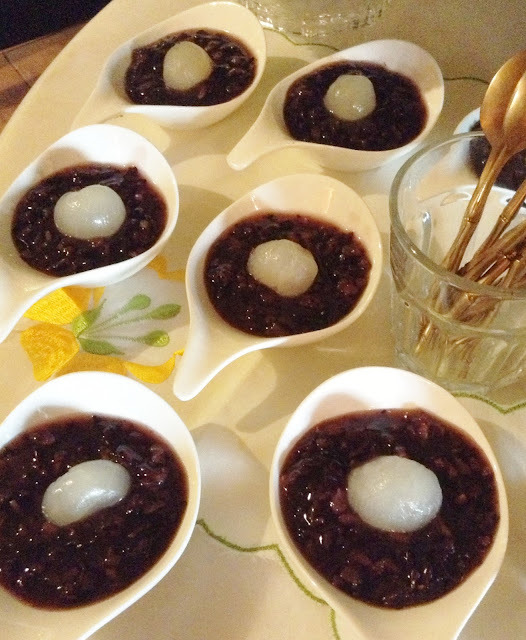 Thai dessert is always fabulous to sample and Chef Korn spared no efforts in conjuring up a mind-boggling selection using glutinous rice, coconut milk, mung beans, grated coconut and eggs. We were gobsmacked by the colours, textures and painstaking work that went into their making. That the chef and his team had put in tons of passion, care and love was simply an understatement. What an eye-opening and invigorating experience it was for me. Beyond the exquisite viands, I understood there's an artist at work here who produces sublime creations that please our stomachs and serenade our souls. Now, that's definitely worth its weight in gold. This is one Songkran celebration that I'd remember forever. May Day! May Day! Expect culinary sparks to fly when three acclaimed Michelin-starred Chefs – Jeremy Biasiol, Serge Dansereau and Alvin Leung conquer The Westin Kuala Lumpur's kitchens for 5 days in May. Staged for the first time ever in Kuala Lumpur, the “Hats Off” culinary showcase from 8 to 12 May will team international and local culinary masters in a series of intimate and engaging dining experiences offering foodies a spectacular dining extravaganza. From the fine Chinese food bastion of Hong Kong comes Jeremy Biasol - the talent behind 1 Michelin Star Mirror Restaurant and the Miele Guide 2012 Asia’s top 300 best restaurant. 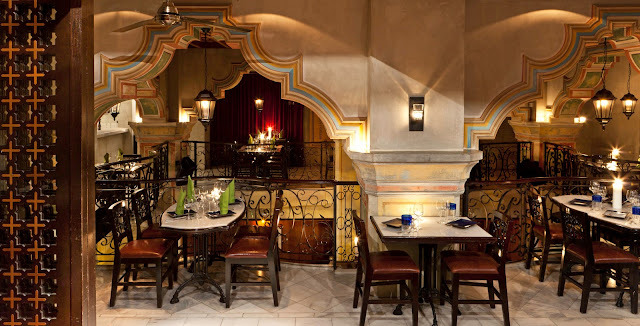 On 8 and 9 May, Jeremy will proffer a specially-crafted set menu at Qba, the popular Latin grill and bar venue. Imagine sampling his Crab Jelly with cauliflower sauce, caviar and crab roes; Beef Tenderloin Rossini with perigueux sauce and Half Maine Lobster with eggplant, lobster and Comte cheese sauce. 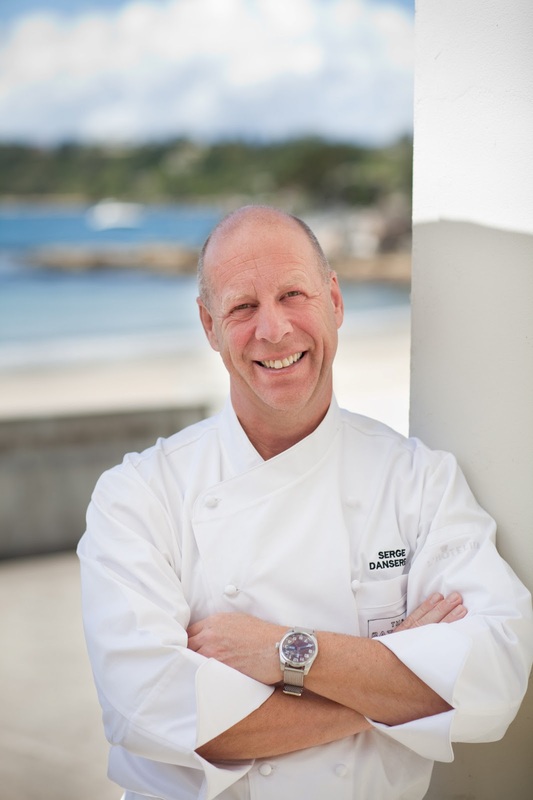 Then brace yourself for the appearance of Serge Dansereau - the celebrated culinary genius of The Bathers’ Pavilion in Balmoral Beach, Sydney, Australia and author of 6 cookbooks including the most recent “Summer Food” (November 2011). 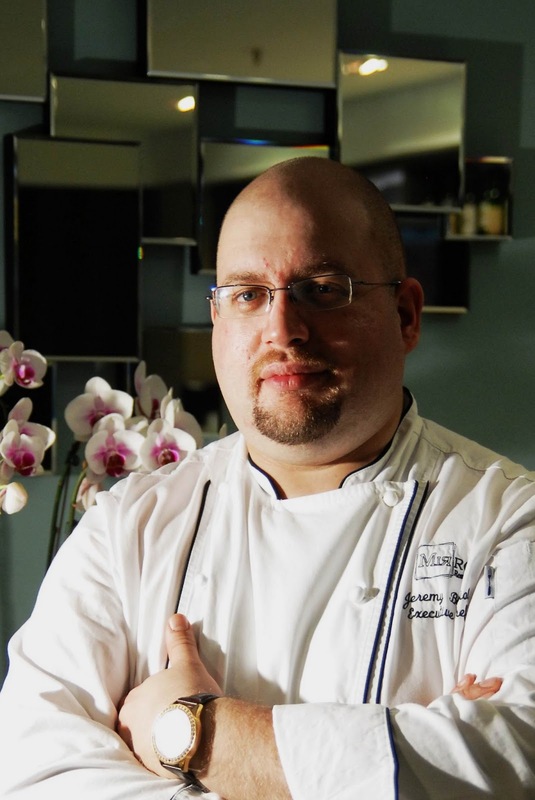 Serge will display his divine creations at the award-winning Prego Italian restaurant on 11 and 12 May. Signature dishes include Galantine of quail, foie gras and leek ash confit leg, verjuice jelly and mizuna; Kombu-baked ocean trout with black salsify baby gold beetroot, dried oyster, woodland sorrel and Duck magret with confit peach, pistachio cream witlof, crisp tongue and kimchi sauce. Alvin Leung and his 'X-treme Chinese' cuisine from 2 Michelin-starred Bo Innovation will take the limelight at Five Sen5es on 11 and 12 May. Turning Chinese cuisine on its head are his Scallop in Shanghainese “jolo” sauce, crispy woba and peas foam; Organic Chicken served with 7-years aged Acquerello rice, yellow chicken stock, wooden fungus with sand ginger chicken jus and Cherry tomato baked in Chinese filo with fermented Chinese olives “lam kok” and tomato marshmallow with green oil. Priced at RM348++ per person (inclusive of wines) and at RM298++ per person (excluding alcoholic beverages), the celeb chefs' specially designed 5-course set menus are only available for dinner. Succumb to the sins of gluttony on 10 May 2013 at the Hats Off Gala Dinner that will unleash the full force of all 3 Celebrity Chefs work alongside Le Méridien Kuala Lumpur’s Executive Chef Antoine Rodriguez, Sheraton Imperial Kuala Lumpur’s Executive Chef, Rajesh Kanna and The Westin Kuala Lumpur’s Executive Sous Chef, Fahdrul Abd. Malek in one sitting at the Westin Grand Ballroom. Each chef will represent 2 canapés and one course whilst catching glimpses of how their 6-course set menu are prepared via a special live feed from the kitchens. Renowned wineries like M. Chapoutier, Paul Bouchard, Banfi, Torres, De Bortoli, Pascal Jolibvet and more will also complement the stupendous feast. Psst! Wanna unearth tips and tricks from your favourite chef? 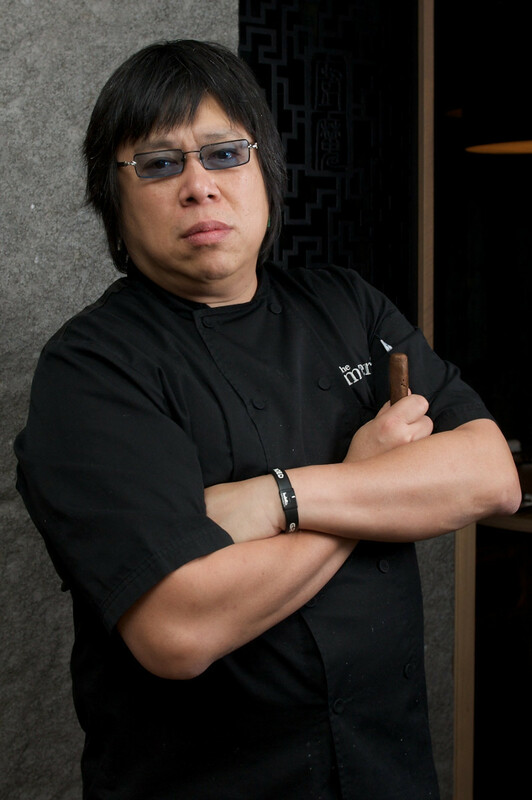 Simply sign up for any of the 2 Master classes presented by Alvin Leung at Five Sen5es or Serge Dansereau at Prego. Limited to 20 persons per session, so advance reservations is advisable. “Hats Off” is Starwood Hotels & Resort’s branded culinary showcase - a platform for multiple renowned chefs and the hotel group’s talented culinary maestros to come together and create an extraordinary gastronomic journey for all fine cuisine enthusiasts. The event concept was developed in 2008 and was first kicked off at The Westin Beijing Financial Street , by its Executive Chef, Stephane Tremblay. The yearly event gained huge popularity within the city and the region. 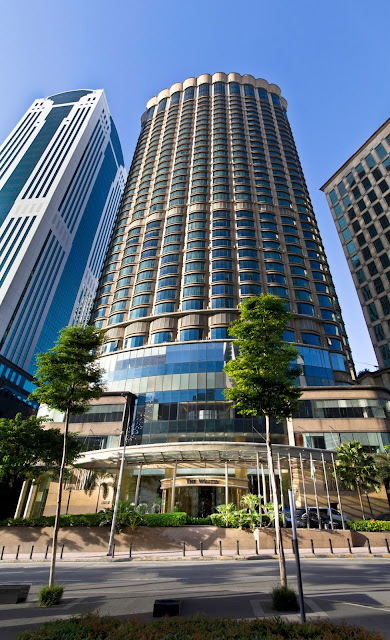 This year, the event is set to take other parts of Asia Pacific by storm, starting with the vibrant city of Kuala Lumpur at The Westin Kuala Lumpur. Given the chance, would you eat gorilla's paw, palm tree worms, monkeys, pangolins and an assortment of wild game meat? No? Then take your hats off to Le Méridien Kuala Lumpur Executive Chef Antoine Rodriguez (pix above, left). He's no swashbuckling hero but a braveheart of daring culinary adventures. The French-Spanish, Bordeaux native has a great sense of humour and passionately relishes his chosen vocation. Chef Antoine is also an exemplary mentor; generously sharing the limelight with his protege, Sazli Nazim Ismail who heads Favola restaurant. Together they're a fab tag team who keep the hotel's F&B flag flying high. 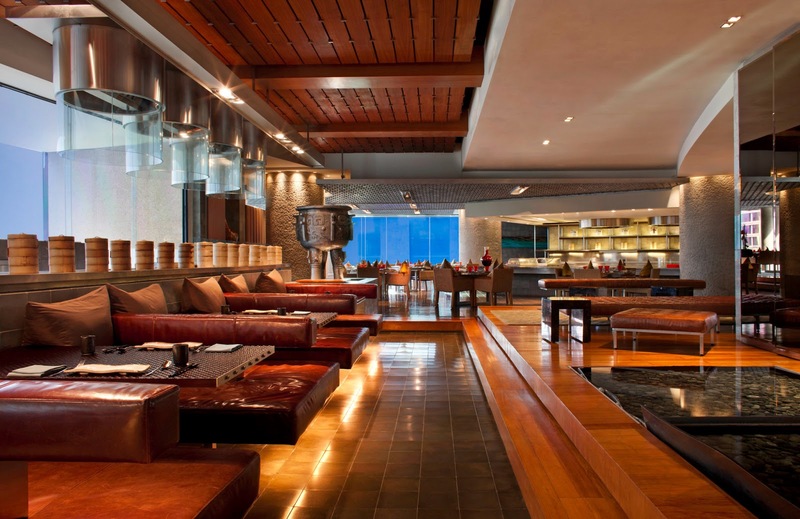 The proof abounds at Gastro Sentral - Le Meridien's uber-trendy, casual dining resto. We were privileged to savour the new A La Carte Menu that was unveiled recently which is packed with irresistible nibbles and tapas and easy palate-pleasers (think pizza, sandwiches & local one-dish meals. Also expect a grilling good time this April with the introduction of Sunday Roasts. To sweeten your dining experience, prices are nett here. This means hidden charges be gone with government tax and service charge accounted for. Between the whimsical bread rolls in cans and light-hearted banter, we had a field day basking in the hotel's hospitality. Robustly flavoured tapas of Chorizo, Spinach and Ricotta Frittata (pix above on right, RM15) and Crab Cake Sliders with Spicy Mayo (pix above, left RM15) reign not only in Spain but at Gastro too. The former is rich, fluffy and so chockfull of goodness that we made short work of it within minutes. As for the latter, can you seriously think of any more wickedly delicious than crab meat, spices and mayo combined? Trust Chef Antoine to elevate the humble sardines to gastronomic heights, reincarnating the little fish into Potted Sardine Rilettes (RM26). I could just live on the slices of crusty garlic cereal bread alone, topped with his sumptuous spread of mashed sardines with lemon, smoked cream cheese and dill, and sliced sweet onion. Munch on those lip-puckering mini gherkin skewers to offset any cloying richness. Got a penchant for prawns? Ah, the Sweet Prawn Cocktail with Chilli Popcorn, Jumbo Green Asparagus and Aioli (RM30) will be the bait to reel you in. A sprinkling of spiced popcorn (yes, spiced! ), some fresh lettuce and fat, crunchy asparagus spears is all that's needed to perk up the crustaceans' unadulterated sweetness. Heavenly! For light munchies with a whole lotta crunch, we recommend the Homemade Nachos with Tzatziki Dip (RM12) . Tastes out of this world when complemented by dollops of creamy, herbaceous Greek-style yoghurt and cucumber-based dip. Lest you forget to breakfast like a king, the Coddled Eggs with Smoked Duck Roesti Potato (RM35) with wilted spinach, wild mushroom cream sauce and Vienna sausage will be a right regal treat. What ruled the roost in this hearty platter is the scrumptious shredded potato pancake with smoked duck in it. A dead ringer for bacon, it has to be the best thing since sliced bread. In case none of the Continental stuff appeal to you, we are sure the Prawn Satay with Condiments & Peanut Sauce (RM20 half dozen, RM38 for 1 dozen) will float your boat. Marinated in heady spices, the succulent skewers are one ship-shape speciality that can rival the best satay in Kajang. Gargantuan appetite will find the humongous portion of Chicken Breast in Long Bun Burger Bread (RM36) sizeable enough to satisfy. Cooked under controlled temperature "sous vide" style, the grilled juicy meat is nicely scented with garlic and basil when you bite into it. Grilled tomato, arugula, pesto, chilli oil, roasted potato with rosemary, salsa verde and grilled red bell pepper mayo lend textural and flavour contrasts to the hearty offering. Chef Antoine and his team intend to whet the appetite with a Weekly Roast on Friday, Saturday and Sunday throughout April. Come 12-14 April, you'd sample Free Range Organic Chicken (half for RM75), 19-21 April - Roasted Beef Ribs (500g for RM188) and 26-28 April, Roasted Veal Rack (330g for RM150). Featuring the same team that helms PRIME - the city's best steak restaurant - expect nothing less than flawlessly roasted meat. Crusty and slightly charred on the outside but pink perfection and moist juiciness galore inside, the roasts are served with all the trimmings: Yorkshire pudding, gravy and veges too. Now our dining party wasn't one to pass up on dessert but this time around, even I had to wave the white flag when a tray of full-size treats arrived at our table. How on earth can we put away those decadent Coffee & White Chocolate Brownies (RM25)? I happily succumbed to the Gastro Peach Melba (RM20) with milk ice cream, raspberry sauce and almond flakes but only managed a mouthful of the homespun Apple Crumble (RM20) with vanilla ice cream and cinnamon sauce. Luckily the guys helped with the Ice Cream Sandwich with sweet cookies, chocolate breakings and choc sauce (RM 22) - the final icing for this indulgent dinner. After all these sweetening, can I raise a ruckus? Nah...I just can't wait to return for more of Gastro's five-star gastronomic treats at four-star pricing. Gastro Sentral, Lobby Level, Le Meridien Kuala Lumpur.